The Bold Collection is an upscale showcase series loved by store designers and retailers alike. Jewelry display cases in this showcase series are build with HPL slab end construction with 1 ½” decorative accents. 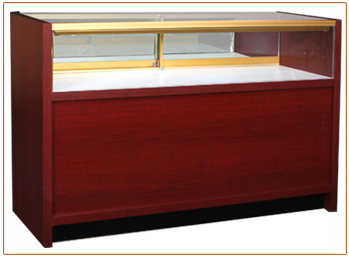 Jewelry showcases have frameless mirror doors on the clerk side of the jewelry display box. Display cases can be customized to include showcase storage, LED showcase lights, security showcase locks, storage cabinets and more.